Gold stretched its losing streak on Friday to three sessions, marked a fourth straight weekly decline, and settled at a fresh 5-3/4-year low. Gold for December delivery shed a dime to close at $1,080.90 an ounce on the Comex division of the New York Mercantile Exchange. The settlement was the lowest since Feb. 10, 2010 when prices ended at $1,076.30 an ounce. "Gold will probably continue to just weaken marginally, we don’t think there’s much more to go because the market’s now factoring in a December interest rate hike," Bloomberg News quoted David Lennox, an analyst at Fat Prophets. The precious metal declined relatively modestly on the week, slipping 0.6% after plunging 4.7% last week. Gold prices are 8.7% lower on the year. Most market professionals didn’t mirror Khanna’s negative sentiment, expecting a technical bounce in gold in the coming week. Of the 37 participants contacted, 14 responded, of which 8, or 57%, say prices should move up. The remaining 4, or 29%, are bearish while 2 participants, 14%, are neutral." Extending its losing streak to ten sessions and hitting a fresh 11-week low, silver for December delivery dipped 2 cents, or less than 0.2%, to settle at $14.20 an ounce. The close was the lowest since Aug. 26 when the settlement was $14.04 an ounce. Silver prices gave back 3.3% on the week after diving 5.6% last week. As for the year, prices are 8.9% lower than their final 2014 settlement at $15.60 an ounce. January platinum declined $13.20, or 1.5%, to $863.70 an ounce, falling 8.1% from a week earlier. Palladium for December delivery dropped $19.45, or 3.5%, to $539.25 an ounce, diving 12% on the week. For the year, platinum has dropped 28.6% and palladium has plunged 32.5%. Gold fell $5.90, or 0.5%, to $1,081.50 an ounce. Silver was unchanged at $14.39 an ounce. Platinum declined $13, or 1.5%, to $866 an ounce. Palladium plunged $25, or 4.4%, to $542 an ounce. Weekly losses totaled 0.7% for gold, 4.6% for silver, 7.8% for platinum and 10.6% for palladium. United States Mint bullion demand has grown in November and sharply, in particular, this week with gold sales the strongest in 2 months and silver sales the highest in nearly 3 months. 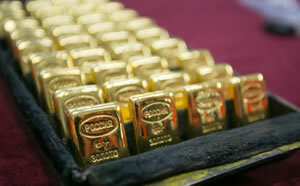 U.S. Mint gold sales jumped 29,000 ounces to more than double last week’s 12,500 ounces. The total is the highest since the week ended Sept. 18. Sales splits included 25,500 ounces in American Gold Eagles compared to 8,000 ounces previously and 3,500 ounces in American Gold Buffalo coins compared to 4,500 ounces previously. In related news, the U.S. Mint on Friday announced that this year’s quarter-ounce $10 Gold Eagle sold out, and that no more would be produced. Weekly sales of bullion American Silver Eagles advanced 1,107,500 ounces compared to the prior week’s 1,079,500 ounces. The total is the highest since the week ended Aug. 21. For the first week in five, all of the Mint’s weekly allotment of Silver Eagles was taken. Sales at 42,029,500 for the year continue at a record pace, up 6.7% from the same time in 2014. Last year when Silver Eagle sales ended at an annual record of just over 44 million, the bullion coins by Nov. 13, 2014 logged sales of 39,381,000.